"Go ahead and weep, Heartbroken Nightingale, for this world is the place of weeping"
The Songs of Hafiz is a unique collection of songs in the World/Folk style. On this CD I've adapted the lyric poetry of 14th century Persian Sufi poet Hafiz of Shiraz to American folk music idioms. The result is an eclectic blend of world and folk melodies which effectively make available the classic beauty of Hafiz's lyrics to the modern, English speaking listener. The CD is $15.00 plus $2.50 shipping. If you buy more than one CD, shipping is an additional $1.00 per item. Click here to send check or money order. To order using Paypal, click the button below. 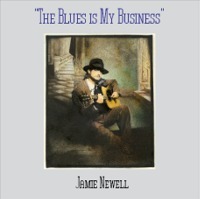 The Blues is My Business is a collection of ten original acoustic blues songs. Songs include: The Blues is My Business; The Death of Robert Johnson; Messin' With the Wrong Fool; Cold Chill; and That's Just the Way I Do. The CD is $15.00 plus $2.50 shipping. ( If you buy more than one CD, shipping is an additional $1.00 per item.) Click here to send check or money order. To order using Paypal, click the button below.